A Pedro Ximenez cask matured single malt from Glendronach. This is from batch 13 of the distillery's highly aclaimed single cask series. Bottled at 21 years old, only 664 bottles have been released. Limited to one bottle per customer. Aromas (without water) Crisp candied peel and white pepper warm rich stewed damsons and plum syrup. Flavour Classic rum raisin and chocolate notes filled with delicate vanilla pod, cinnamon and gentle stewed barley. 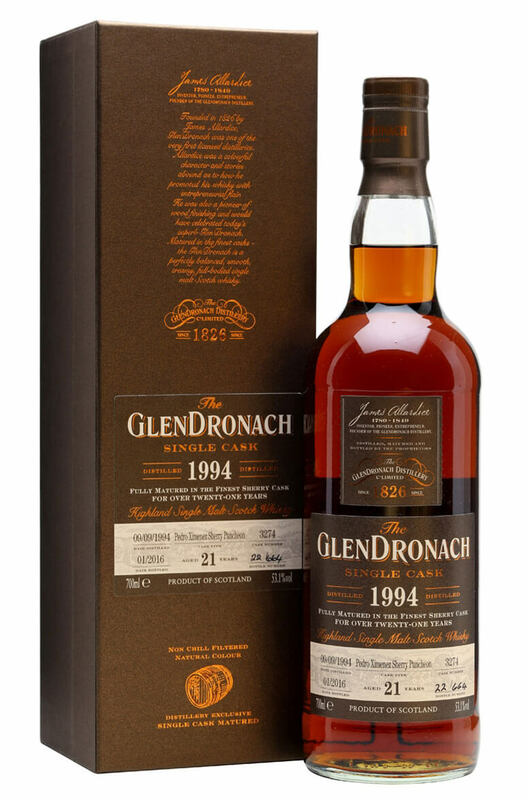 One of the younger releases in Glendronach's Batch 13 of single cask releases. This was matured ..